One of the leading local mobile brand Cherry Mobile, announced the thinner and lighter successor of their CM Razor, the Cherry Mobile Razor 2.0. It packs a bigger display with a higher HD resolution, thinner frame and a better camera. Powered by quad-core processor clocked at 1.2GHz, the dual-SIM Razor 2.0 comes with 1GB RAM and 4GB internal storage, running on Android 4.3 (Jelly Bean) OS. Sports a 4.7-inch HD IPS display with 1280×720 resolution, equivalent to 312ppi, a 2-megapixel camera in front and an 8-megapixel main camera with flash. In terms of wireless connectivity, the Razor 2.0 features Bluetooth 4.0, GPS, and Wi-Fi. 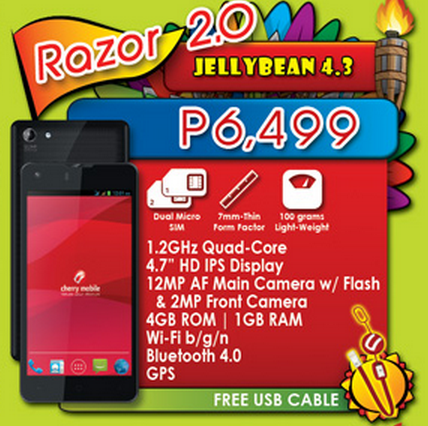 Cherry Mobile offers the Razor 2.0 for Php 6,499.